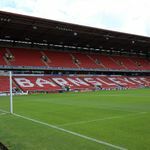 South Yorkshire Police have arrested a man on suspicion of racially aggravated assault and a racially aggravated public order offence at Barnsley on Saturday. Their investigation relates to an incident which took place at Oakwell, where Barnsley beat Fleetwood 4-2 in Sky Bet League One. “Officers investigating an incident at Barnsley Football Club on Saturday 13 April 2019 have arrested a man on suspicion of racially aggravated public order offence and racially aggravated assault,” read a statement from South Yorkshire Police.